Water Protectors opposing the Enbridge Line 3 tar sands crude oil pipeline blocked a bridge near Bemidji Tuesday, erecting a tepee and holding a water ceremony, according to an MPR story. No arrests were made, but it’s the latest in a series of actions against the pipeline. 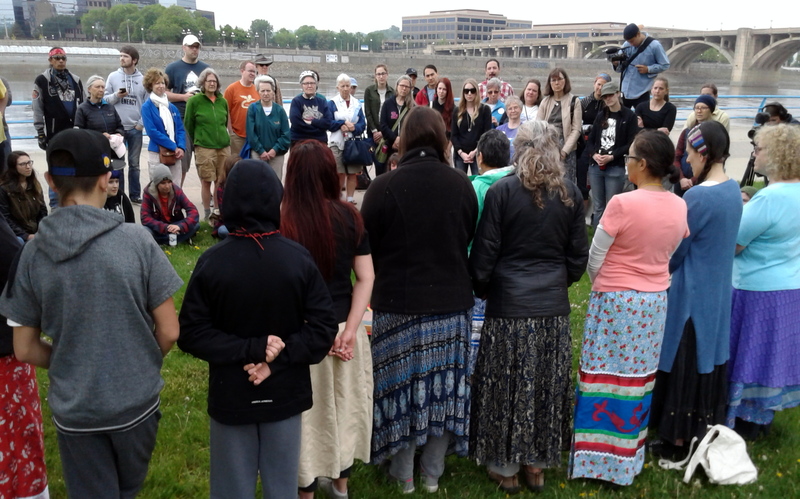 On Sept. 11, water protectors disrupted and delayed a Minnesota Public Utilities Commission vote on Line 3 permit conditions. On Aug. 29, water protectors blocked a Bemidji intersection for four hours. Other volunteers took their laptops and tablets to Gov. Mark Daytons’ reception room and live streamed the event, an effort to pressure him to get off the fence and take a stand against Line 3. In Bemidji, 26 people received disorderly conduct citations and face mandatory court appearances. Sadly, Dayton remains silent on whether he thinks Minnesotans should have this crude oil pipeline shoved down their proverbial throats. Sign a petition telling Gov. Dayton that Line 3 is a danger to our community. Sign a Pledge of Resistance to Line 3, with options ranging from hosting an event to participating in a direct action. Water Protectors Ask You To Call Gov. Dayton to Stop Line 3! Water Protectors occupied an intersection in downtown Bemidji Wednesday to put Gov. Dayton on notice that opposition to Enbridge Line 3 is not going away. Approximately 50 Anishinaabe leaders, faith leaders, and environmental activists occupied an intersection in downtown Bemidji for about three hours Wednesday to continue to bring attention to the tremendous risks posed by the Enbridge Line 3 tar sands pipeline and to pressure Gov. Mark Dayton to take a stand opposing it. 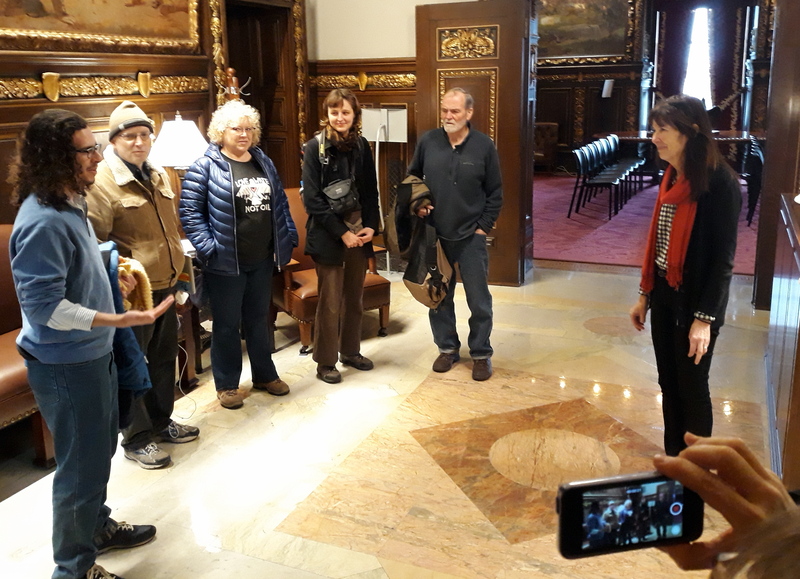 Simultaneous to the Bemidji action, other water protectors occupied the anteroom at Dayton’s Capitol office with laptops to Live Stream the event. Twenty-six water protectors eventually received disorderly conduct citations from Bemidji police when they refused the order to disperse. Dayton has declined to take a position on Line 3. For the past year, he has said he wanted to wait and let the Minnesota Public Utilities Commission (PUC) make its decision. That decision came in June, and it was irresponsible. The PUC went against the advice of state regulators and the Administrative Law Judge reviewing the proposal and approved Line 3. The project threatens Minnesota’s clean waters and the world’s climate. The main beneficiary is a large Canadian corporation. Dayton’s silence is his tacit approval with the project moving forward. The action was meant to let Dayton know that opposition is not going away. Call the Governor at 651-201-3400 or 800-657-3717 and let him know that you expect him to do everything in his power to ensure that the Line 3 tar sands pipeline is never built. 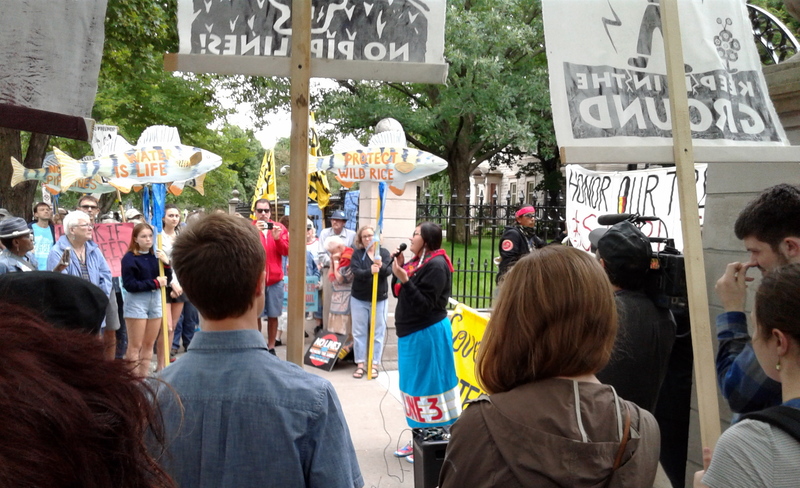 Youth Climate Intervenor Rose Whipple (Isanti Dakota and Ho-Chunk) spoke to several hundred water protectors gathered outside Gov. Dayton’s mansion. 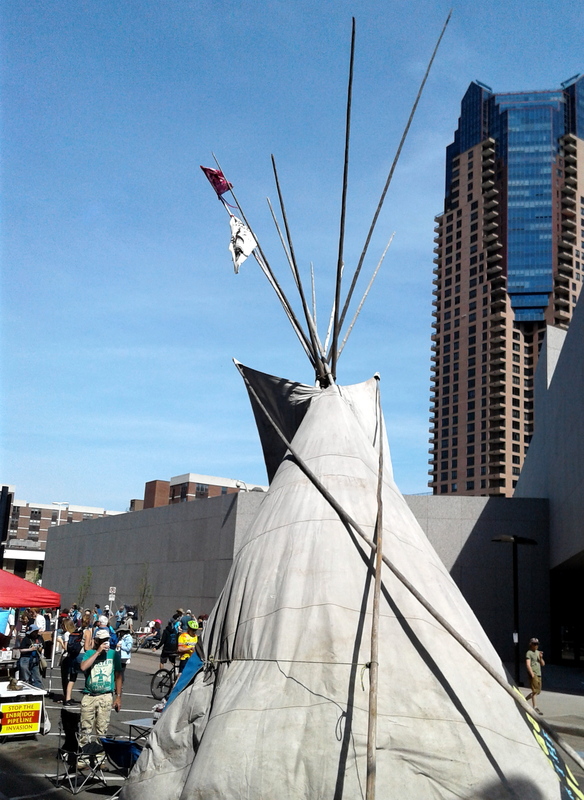 Three days after the Minnesota Public Utilities Commission (PUC) approved the Enbridge Line 3 tar sands crude oil pipeline, several hundred people gathered peacefully outside Gov. Mark Dayton’s mansion to press him to take action to stop it. Today’s event included singing, chanting and speeches highlighting the PUC’s flawed process and the human and environmental damage the pipeline would cause. Participants filled the sidewalk in front of Dayton’s home with chalk art and messages, such as “No jobs on a dead planet,” a reference to Line 3’s climate change impacts, estimated at $287 billion over 30 years. Speakers thanked Gov. Dayton for the strong testimony from his Minnesota Department of Commerce, which argued the pipeline wasn’t needed; they also challenged him to come out publicly against the project. 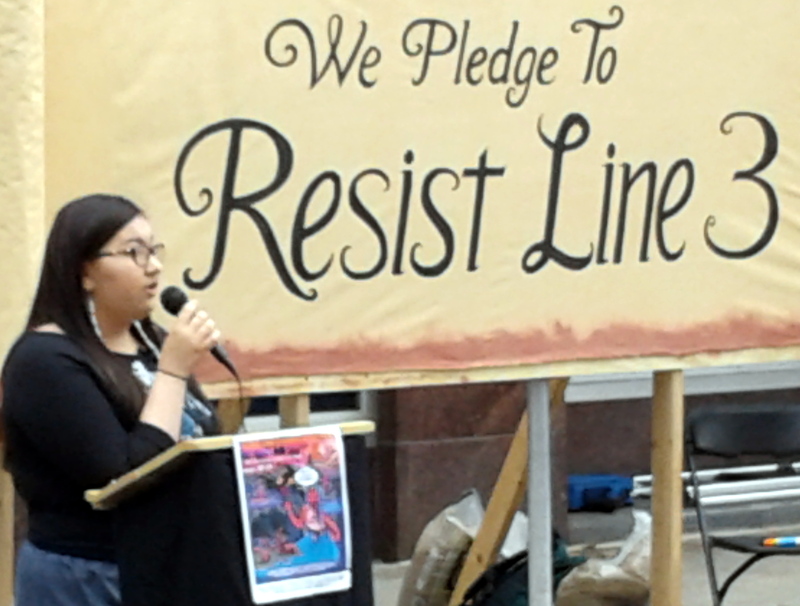 Today’s event was sponsored by Stop Line 3, and co-hosted by Honor the Earth, MN 350, Minnesota Interfaith Power and Light, and the Sierra Club’s North Star Chapter.